On Sunday afternoon, a few day prior to our departure, we visited the Museum of Memory and Human Rights, that illustrates the attempts against life and dignity against Chileans from 1973 to 1990. Whiling touring the museum we were filled with emotions of sadness, anger, fear, and sympathy for these innocent people. 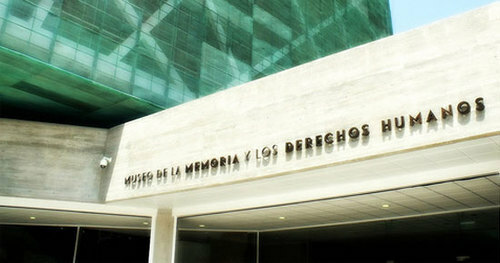 The museum depicted the 3185 executions and disappearances that were related to the new found dictatorship and political unrest. One of the early exhibits that we saw was large a map of Chile made of stone lying on the ground. Throughout this stone were many markers with pictures of current memorials to honor and remember the people affected by violation of human rights. It was shocking to learn and visualize that human torture and political imprisonment took place throughout all of Chile, not just in one area. We learned about the history of Chile while touring the museum. On September 11, 1973 La Moneda palace was surrounded by soldiers, tanks, and helicopters as the Military demands President Salvador Allende’s resignation. With President Allende the military opens fire and many people die or are captured and disappear forever. President Allende was found dead and the Military Junta takes over control of the country. It’s interesting that 9/11 is a significant day in other countries as well. The new Government Junta, a dictatorship, sets new laws in which strict curfews were implemented for the Chilean citizens, the approval of the death penalty, closing of Congress, and prohibition of all political parties. Civil liberties were restrained under this new government, and fear among Chileans grew as persecution, torture, assassinations, and covert burials increased. There were exhibits about the use of electrocuting beds, drowning related to cement blocks being attached to people, and shootings just as a few examples. It is unbelievable what people went through. Additionally, thousands of Chilleans were kidnapped, exiled, or expelled from the country. A quote from a relative of a disappeared detainee states, ‘It’s terrible when somebody is executed, but you see it happen. You can bury him or her, take flowers to the grave and be in mourning. But in the case of those arrested and disappeared you don’t know where he is, you don’t know what happened to him, whether he is cold, hungry or if he’s really dead. This is something for the entire family to go mad.’ Thinking about this quote, one can only imagine how devastating it must have been for a loved one to just disappear and know nothing. Age was not a factor, as thousands of children observed their parents being kidnapped and tortured, or their homes being searched. Many children were forced into exile and hundreds were tortured, assassinated, or disappeared. One of the exhibits was pictures and quotes by the Chillean children during this horrible time. Art therapy (a form of therapy we have used during our psychiatric nursing rotations at home and observed here in Chile), was used to help the children express their feelings. Some of the pictures showed fighting between the military and residents, people being taken away by the military, and people behind bars. There were pictures of cemeteries, and people caring for those injured. The faces on the pictures showed fear and sadness with tears. There were no happy pictures displayed in the exhibit. The Military dictatorship lasted 17 years. During that time the Chilleans did all that they could in terms of protesting to restore peace and human rights. Other nations and human rights originations became involved in the fight over time, and helped expose what was occurring in Chile. The most memorable exhibit is a mural that is 3 stories high and the length of a very long wall that displays photos of the victims who did not survive the dictatorship. Throughout the display are empty frames for additional photos to be added and account for those still missing. There were electric candles placed as a vigil to help remember and denounce the loss of these people. It was mind-blowing to learn that something like this happened for so many years, and for us to be in college and just learning about it now. Reading some of these peoples stories and quotes, and watching short movie documentaries was heartbreaking. Words cannot describe how we felt. View aphoto galleryfrom the trip. Read older (and newer) posts in thearchive. 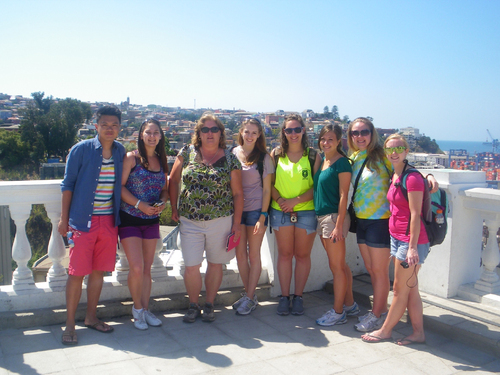 On the Monday before we left Chile, we spent the day in Valparaiso, a coastal city about 2.5 hours from Santiago. The city is made up of many steep hills and valleys, much like San Francisco. Even here, there was definite evidence between the rich and the poor. Some homes had eccentric architecture, built on top of the hills overlooking the water. Others were more noticeably poor, with rusty tin roofs and walls made from mismatched wood. Graffiti was everywhere, though much of it was actually quite beautiful. 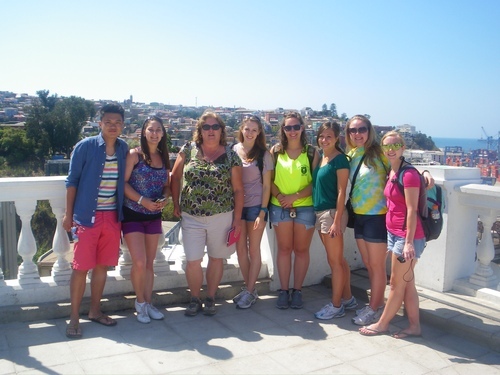 Professor King had downloaded a book on her kindle that gave a step by step (no pun intended) tour of ‘Valpo,’ complete with anecdotes about the historical buildings and landmarks. 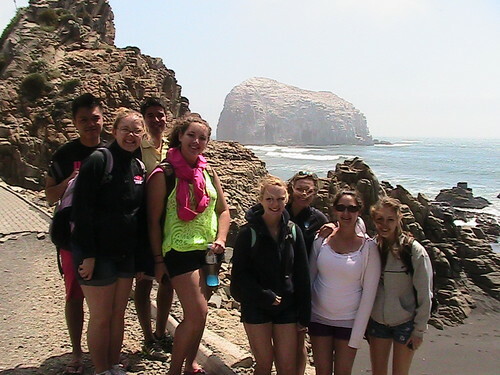 We walked around the city, admiring the landscape, architecture, and view of the ocean. One of the unique hallmarks of Valpo is the sight of funiculars going up and down the side of the steep hills. Funiculars are railways on which rides a small wooden boxcar that can fit around 10 people. This wooden car moves along the railway, up and down the hills, giving peoples’ legs a break but still allowing them to reach their destination. The funicular we went on was at about a 60 degree angle and very old looking (yikes! ), but gave us a beautiful view of the city as it went up the side of the hill. As we walked around the city, Professor King told us a brief history of Valpo. In the 1500’s and 1600’s, Valparaiso (meaning Paradise Valley) was the site of the Chilean navy. Later, still before the Panama Canal was built, Valparaiso was an essential stop for food and water for large boats rounding Cape Horn. Currently, it functions both as an important seaport and tourist destination. Valparaiso definitely rivals the other places we saw in Chile in terms of beauty and charm. My only complaint? That we did not have enough time to see everything the city has to offer! Pizzas, hotdogs, and pasta…in Chile?! 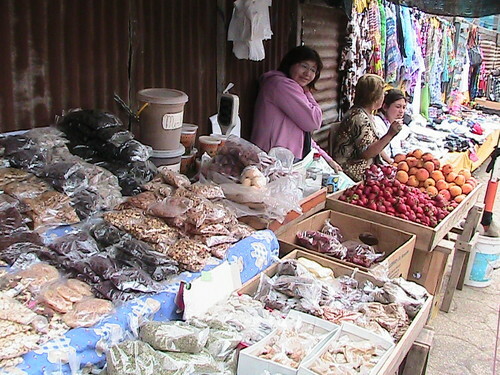 A local women selling herbs and beans and vegetables. I’d like to make a blog about FOOD. I don’t just love food, I’m IN love with food. Being in Chile for 2 weeks though, I realized that I didn’t crave that much american food. Sure, there’s norefrigeratedmilk, but on the whole, I was pretty satisfied with the food I had in Chile. 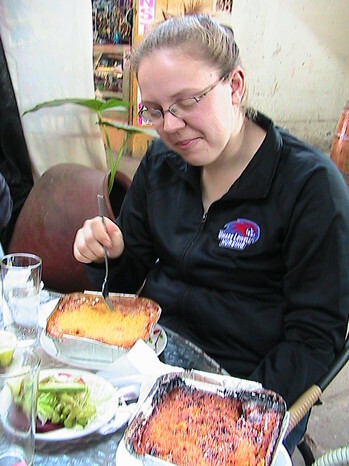 During the two weeks that we were there, I was hoping to try out authentic Chilean food. Surprisingly, it was actually quite hard. Empanadas (stuffed bread more or less) were everywhere, and every other meal consisted of an empanada for the last two weeks, but we were only able to eat good authentic Chilean food a handful of times. One dish in particular that I really enjoyed was “Pastel de Choclo” which consists of ground meats topped with a crust of sweet corn and cornmeal. If you look it up on Google, pictures do not do it justice. The sweetness of the caramelized corn dough compliments the savoriness of the ground meats hidden at the bottom. It’s a perfect blend of sweet and savory that made mytaste budsjump for joy.It reminded me of a Spanish Shepard’s Pie since the dish was in layers. I didn’t really crave american food since a lot of the foods that you’d see in America were also in Chile. Hotdogs, pizzas, KFC, McDonalds, and many other fast food places were abundant even in the most rural areas. Thecondimentson a hotdog were not just mustard and ketchup, it consisted of a thick layer of guacamole and a giant helping ofmayonnaise. A lot of burger joints were seen in the malls and along the streets as well. Again, these burgers were topped with a heavyheapingofmayonnaise, bacon, and guacamole. Every food item had a side of fries as a meal. I couldn’t escape fried foods. The amount of trans fats and calories made me worry that I’d gain a ton of weight during these two weeks (luckily I didn’t). With all of these fast foods that could be bought at a cheap price, it raised my concerns of obesity in Chile. Surveying the street, I’d safely assume that most Chileans looked fit. A lot of people were biking and walking around. No one seemed overweight, but with all of these fast and fried foods, I’m sure that the rate of obesity will slowly increase as the years progress. With the increase of obesity comes complications such as heart problems, high blood pressure, and high cholesterol. After doing some research, I noticed that Forbes voted Chile to be the 23rd most obese country in 2007. We did see some actions done by the government that promoted healthy living. On our way to a beach in Constitucion, there was a public gym that had anellipticaland various exercising machines that was out in the open. I wanted to try out more Chilean food, but with the copious amounts of fast foods, and difficulty of finding a nice chilean restaurant, we resorted to eating pizzas and emapanadas. Every restaurant that we’ve been to also has a large selection of italian pastas! All in all, it my stomach was pretty satisfied. I still craved my biweekly helping of sushi, and there were a lot of sushi shops around, but I didn’t want to risk getting an upset stomach while on the trip! 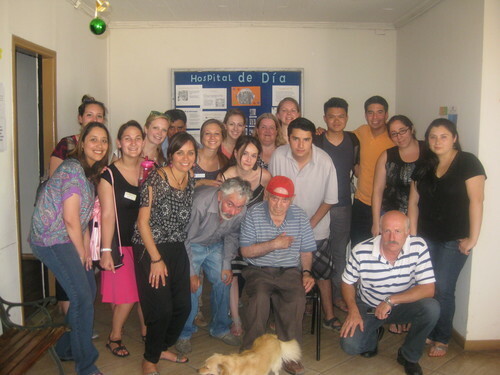 It is very important for myself and the students at UMass Lowellwho traveled to Chile to thank Javier Cifuentes. He is the son of Manuel Cifuentes who works for UMass Lowell. 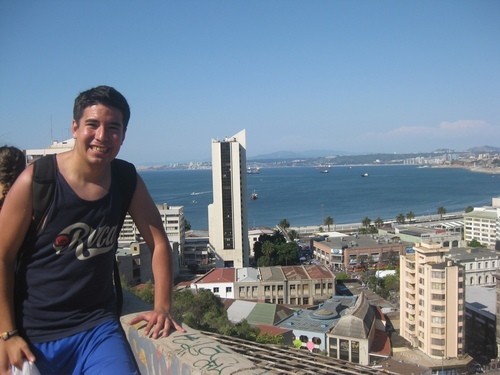 Javier is a student at BU and a previous resident of Chile before moving to the United States at age nine. He is fluent in Spanish and knows Chile. This young man took upon the huge responsibility of being our liaison and translator. He willingly gave up his own semester break to travel with us and listened to our many questions such as “what does this mean,” “can you tell me how to ask the patient (bus driver, waiter, banker etc. )” and a million other questions. He is a kind, generous and joyful person to travel with. This trip challenged him as well as us and we thank him for his invaluable assistance. Read older (and newer) posts in the archive. Today is our last full day in Santiago. Many of the students are tired and I am sure would like to sleep in.I have decided to go to Valparaiso and have invited anyone who would like to come with me.I am pleasantly surprised that instead of hanging around the pool today they are willing to go to a historical site. I have done some reading on this city that used to be a bustling stop for cruise ships and other shipping prior to opening of the Panama Canal,as the ships would have to pass by here before rounding Cape Horn. 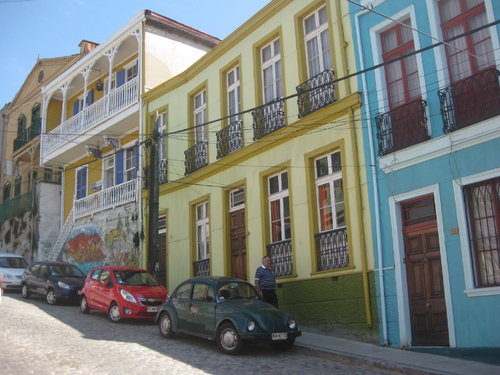 For the last century there has been some decline in this port city and it has only been recently that it was declared a UNESCO site and there has been much attention given to it. Many areas are being renovated while preserving the artistic and architectural elements. There are old buildings and 1940’s era electric cable cars juxtaposed with sleek buildings and gas-powered city buses that crowd the streets. It is like San Francisco in some respects and can best be visited by foot (and we certainly did a lot of walking yesterday). After visiting other cities affected by the earthquake, we wonder how this city fared in 2010. The precarious buildings and location of homes on the steep hills would seem to be a recipe for disaster. Many photos are taken (see our gallery for some great pictures) and after 3 hours of climbing roads of cobblestone and riding up one of the 15 funiculars (ascensores) that are scattered throughout the city, we are ready to find our way back to the bus terminal. We have become a well trained travel pack as we make our way through crowded streets and city buses. Despite the crowded conditions, the people of Chile are not rude and pushy.I am impressed with how many people use the city buses and actually respect and follow the rules of crosswalk signs. We know that this would not be the case in many urban cities in the USA. Our time is short so we do not have time for a real meal before we take the bus back to Santiago. We have become pros at visiting the local Lider (food market) and find some food.It must be a subsidiary of Walmart because we see these stores all over Chile and they carry the same Walmart private label “Equate” and other familiar products from USA. I guess Walmart has moved into every city even beyond the borders of America. The energy level of the students is obviously waning as they think about home and the approaching start of school. The seniors are anxious about pending placements for their Precepted Practicums and the upcoming HESI exams. The juniors have new clinical rotations starting and a big drug calculation exam in the first few weeks of the semester. Our one Sophomore has learned a lot about what to expect in the next two years and is very excited about finally taking some nursing courses. She (Sarah) is very fluent in Spanish and has been so valuable during our trip. The people of Chile are drawn to her as she often stops to chat with taxi drivers, hotel staff and others. Many of us are very hindered by our lack of Spanish fluency. We are all trying very hard to work on our vocabulary, but it is frustrating when sightseeing and also when trying to communicate with patients. We are developing a keen awareness of how it must feel for our patientsat home who are not fluent in English. On this trip we struggle to determine if we are ordering shrimp (camarones) or by mistake we are getting clams (prawns).It makes a big difference if you hate clams but love shrimp (believe me…I made this mistake). I can now imagine how frustrating it is for patients to try to communicate with their nurses to tell them about their symptoms or other information that is vital to their recovery. So although we have left Talca, which was our “academic week” we continue to learn about factors in the health care system and how we can take that knowledge with us to make us better nurses.A few of us took a final walk around our hotel at 11:30 last night and realized how “familiar” this part of the city has become for us. We know exactly how to get to the metro and are finally figuring out which direction to take the subway. We have seen some familiar faces at the food market, metro and hotel complex. Although it makes our day a bit easier having this familiarity, we long to see our families. Tomorrow we only have a partial day here in Santiago and then off to the airport. It has been a good trip and we have learned so much.I continue to be impressed by the students’ description of their experiences and I urge you to read their blog entries.I have told them to continue to write a few entries upon their return back to Massachusetts. Thanks so much to our families and friends and also the people at UMass Lowell who have helped and supported us in our journey to Chile. There are so many people to name, but I need to particularly thank FernMacKinnon and her staff at theStudy Abroad office, Michael Pueschel and the web/communications staff, the faculty, Dean and staff of NURSING and S.H.E., Manuel Cifuentes for being our “point person” during this whole adventure, and who was my first conspirator in developing this trip, and lastly to the Manning family for their support and vision in recognizing that global health experiences can truly enrich a nurse’s education and make him/her a better nurse. The past few days have been a whirl wind and it has been hard to find time to blog. That being said, this entry is about our events on Thursday morning. Thursday morning was our chance to see the last treatment stop psychiatric patients make on their way to recovery. The facility we went to was a lovely house, which was built after the earthquake demolished their old building. The workers here (which included psychologists and social workers) helped to give the patients independence by teaching them a skill that they could then use to get a job. Examples included baking, knitting, and gardening. In fact, the breakfast they served us included bread and berry pastries that the patients had made themselves. They were delicious! Earthquake damaged home in Constitucion, Chile. Both the workers and patients were so kind there. One of the patients spoke a little English and she sat and talked with me in English for a while. I was so impressed that she put in the effort to speak with me! We all fully realize now how exhausting it can be to try to talk to someone in another language! We can all safely agree that whatever Chileans lack in medicinal psychiatric care, they make up for in compassion. Every place we have gone, the workers have been a team who do everything they can to get the patients back on their feet and out in the community again. However cliche is sounds, it really is such an inspiration the way these people dedicate their lives to help people who are less fortunate. More on life in Chile later! This is Katerina Kafkas… writing from Henson’s account. The trip thus far has been amazing. Everything here is just different, including the water. A large portion of the bottled water here is “con gasificada” or “with gas” which is basically a seltzer water but is not appealing when it’s warm or when you are parched. 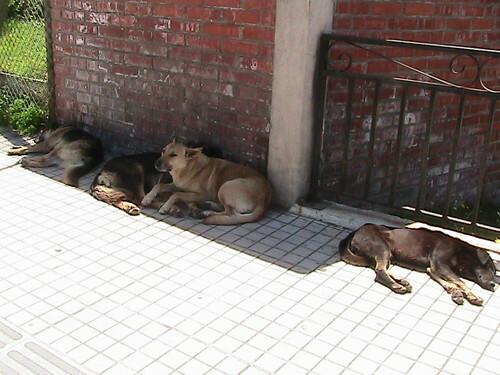 Stray dogs are everywhere on sidewalks and even beaches. We try to keep a safe distance, but every now and then a friendly stray joins us for one of our walks. The people here are very welcoming and kind. We are greeted with a hug and a kiss on the cheek from everyone including the psych patients. It’s been a great opportunity to travel around Talca and see just about every aspect of its psychiatric system. One of the facilities we were able to observe in Talca was an outpatient drug and alcohol clinic. We were greeted outside by stray dogs and inside by a security guard. The waiting room is crowded with patients waiting to be seen. We were educated by a tech and psychologist on what kind of patients they saw and their therapies. The illicit drug they primarily saw in the region was cocaine. They have various forms of it including a “coke paste” which is a concoction of cocaine and other drugs, like rat poison. This paste is available for the same price of a pack cigarettes, 500 Chilean pesos or about $1. This facility, also works with children since there has been incidences of children as young as 10 using inhalants, like computer spray. All patients get therapies from a team consisting of a tech, psychologists, social worker and psychiatrist. 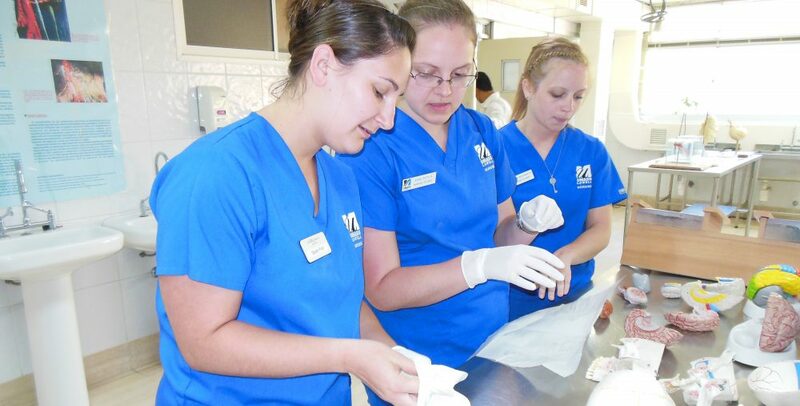 No nurses were involved in this program due to funding, but it was relayed that they wanted nurses. The therapy they provided to patients was very comprehensive and individualized to the patient. Unfortunately the building itself wasn’t the greatest due to the earthquake. Multiple patients receive counseling in the same room and the only thing separating these therapies is a divider that resembles the wall of a cubicle. This eliminates the confidentiality. This would make it difficult for an individual to come forward with a drinking or drug abuse problem. In addition, the facility did not include AC since its a “temporary” location after the earthquake, which was about 3 years ago now. This may seem like a minor issue, but when we went to visit the facility it was 97 degrees outside and felt even hotter inside. I find it difficult to have a therapeutic environment for a patient at a temperature so oppressive. Much more to blog about in Talca. We have had poor connection in the hotel and will try to keep everyone posted. Stay tuned. On Friday, we went to a city called Constituci’n. We traveled via train from Talca and that was the first exciting part of the trip. All of us were expecting a large modern train but we were all surprised when a tiny, old, rickety train pulled up to get us that had to date back to the early 1900s. It was a loud, bumpy train ride and the conductor honked an extremely loud horn throughout the trip that made many of us jump with surprise even after hearing it several times already. The train ride was filled with beautiful views of mountains, rivers and large fields of different crops. Sometimes, the train even went between a clearing between two cliff edges making a small tunnel. The seats were small and uneven, but the experience made up for it. Halfway to our destination, the train stopped in a small village in the middle of nowhere with food vendors of homemade goods and a small, family-owned shop with snacks and water. The locals of this rural town looked us up and down in awe but they were very welcoming to us. Some of the houses we saw along the train ride were very small and run down, like shacks. I found myself wondering throughout the trip how much access they have to food, healthcare and other basic needs to sustain life since they lived in such a rural part of the country. As we got closer to our destination, I noticed more and more poverty. I saw homeless people laying alongside shacks in old ratty clothes on cement or grass with shabby old blankets. 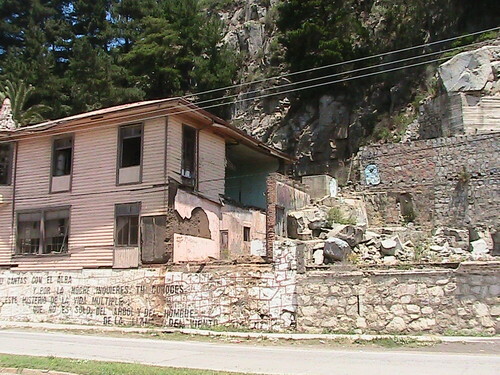 When we got to Constituci’n, I knew it was the poorest place we had visited in Chile so far. The train station we arrived at appeared unclean and people immediately started begging us for money. We then began to walk to find food. 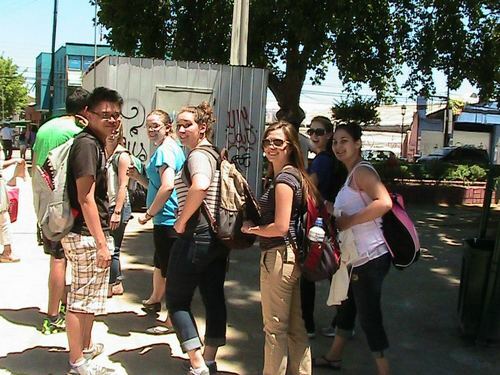 Our journey began on uneven sidewalks alongside abandoned, earthquake-damaged houses. The sidewalks crumbled beneath my feet and I couldn’t help but worry for the safety of the community and wonder how any handicapped person could get from point A to point B in this city. We made our way to a street with tons of markets and vendors selling used clothing that were thrown about in piles, with people scavenging through them, desperately searching for something to buy. Street vendors also sold food. To our surprise, we saw whole, cooked chickens sitting out in the hot sun for sale. I saw hundreds of rotten strawberries sitting out at a fruit stand for sale, and we also saw eggs for sale that were not being refrigerated. Overall, we noticed there was little attempt to repair earthquake damage whereas in Talca we saw a ton of construction and less damage due to the fact that many buildings had already been repaired since the earthquake. We then went to a restaurant, which was just a kitchen in a market with four women cooking traditional Chilean food in front of us at tables right next to them. This was honestly my favorite dining experience in Chile overall. Many of us got homemade pastel de choclo; this dish is a casserole with ground corn, chicken, ground beef and hard boiled eggs, and it is served with sugar on top. It tasted amazing and sweet. Next we ventured to the beach. 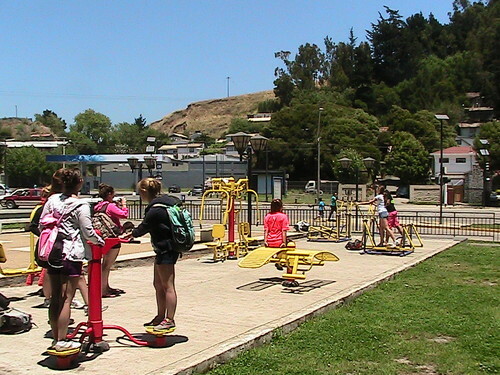 On the way there, we came across a park with different stations to workout and get physical activity. There was a sign with directions on how to use each of them, how long to be at each station and how many sets to do on each machine. They had equipment to train cardiovascular, flexibility, strength and conditioning. We thought this was awesome that they promote a healthy lifestyle in this city. We also saw some of these in Santiago. Finally, we arrived at a beautiful,cliff-sidebeach with breathtaking views of rocks and caves, turquoise water and black sand. Along the beach were small shacks and concession stands selling snacks and drinks. We were amazed because in the U.S. this type of beach would be lined with multi-million dollarbeach-sidehomes. It would probably be inhabited with rich,upper-classcitizens. This beautiful beach however was very humble. The only other odd thing we noticed was that right next to this beach there was some sort of industrial factory with enormous piles of sand and construction vehicles outside. We thought it was odd to see that right next to this beach, on the water. Overall, we saw the most poverty and earthquake wreckage so far in Constituci’n yet I think it was the most fun and culturally-enriching experience so far for a lot of us. Who would ever think you could become so connected with a group of people in such few days? We were amazed by how close we became with these patients and workers in the Hospital de Dia, where we spent the majority of our time. Despite multiple communication barriers (sign language and Spanish) we really formed a lasting bond with these individuals. These people were more than happy to take us in with open arms upon arrival, greeting us with hugs and kisses on the cheeks. They invited us to join them in breakfast, and included us in all daily activities such as coloring and morning exercises. The staff wanted to take photos with us and made our coloring pages into a book to help them remember the time we spent together. The patients faces lit up when they saw us either in the facility or out while doing their daily business. In one instance a patient was at a local food store purchasing groceries and saw us passing by. He yelled and waved to us and then we ran over to say hi and see how his day was going. We were thrilled that we made such an impact on this young man’s life just by connecting and spending time with him. When it came time to say good bye on our last academic day we were all emotional. Many of us had to fight back tears as we hugged our new friends goodbye. The thought of potentially not seeing them again made it tough, but still being able to keep in touch via email helped ease the pain. These care providers really inspired us to go above and beyond for our patients and showed us that the nurse patient bond is truly built on trust, respect, and compassionate care. We learned that despite communication barriers people can still connect if they are willing to take the time and effort into trying. It is hard to believe that we have been here for a week now. The experiences have been varied and challenging. I have just read the student blog entries for the last few days and I am impressed with their ability to capture the moments. Students walking through Talca doing a community assessment: examining roads, buildings, pubic services & people. The people of Chile have been so welcoming and warm. I know that when we walk down the street we look different and we collect some stares. 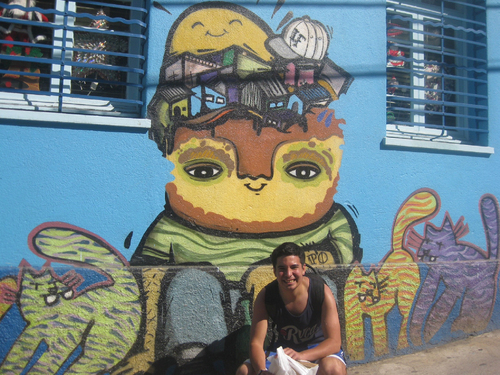 We are a funny looking group of nine as we walk through the streets of Talca with our backpacks and stop to take pictures or to watch a stray dog. 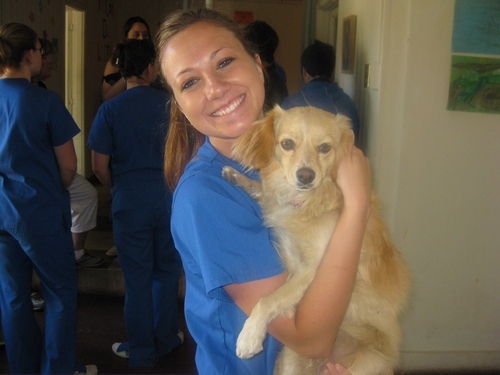 There are lots of stray dogs and it is interesting how this interests the students. Talca is also a city but of course not as big as Santiago. It is has taken us a few days but we are finally getting a sense of direction. The streets are laid out in a grid so the streets are either parallel or perpendicular with an occasional rotary. Transportation is readily available but we are finding that our clinic locations are walkable so we have been walking and exploring a bit in the last few days. 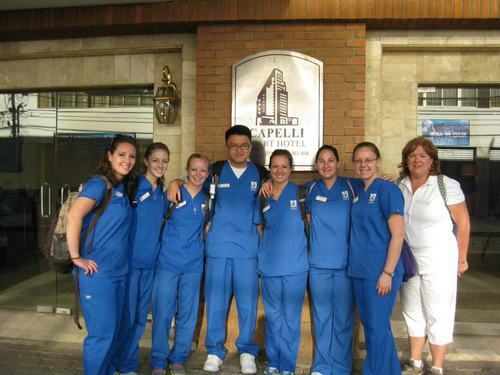 Yesterday we had some great experiences that the students blogged about at Hospital de Dia. We were able to watch multiple patient evaluations by the multidisciplinary team. Half of the student group was in the room with the patient and the team and the other half was behind one way glass wall. Patient permission was obtained to have the students present. It was a bit difficult to follow the exact conversation due to language barriers and translation but what was so apparent to me and the students is that the team of health care professionals care deeply about these patients and each use their own skills in helping to address issues. Mid way through the day we have “breakfast” with the staff, students and doctor. We are all impressed by these people but today we are especially impressed with the doctor who describes his passion and involvement in the movement in Chile to address the delivery of psychiatric care and make it more community based with varying levels of care that depend on the acuity and disability of the patient illness. He takes that time to draw a schematic so that the students can see the relationship between the various types of care and the multiple “safety nets” that are designed to prevent hospitalization of the psychiatric patient. He is also very appreciative and respectful of the nurse’s role in the care of the patients and truly partners with the nurse to improve the care. He was very generous with his time to explain various points with the students. After a lunch we went to the outpatient evaluation center which is actually only a few blocks away. The facility was small with a crowded waiting room. There was a nurse who manages a special government sponsored program for anti-psychotics but she was the only nurse. This facility seems to employ more therapists, social workers and psychologists. It is small and crowded and we were surprised to see children in the waiting room. This is the first time we have seen children as patients. All of these agencies have had to relocate orrenovatedue to earthquake damage. Some are still in temporary quarters and waiting for the new hospital to be built or for resources to build or rent a permanent home. 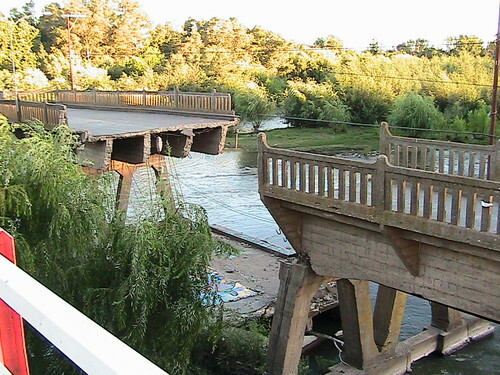 Earthquake damage to a bridge in Talca, Chile. One question I have asked at multiple locations is to what extent the earthquake had on the incidence of mental illness or exacerbation of current known patients. Surprisinglymany of the health care workers respond that they do not feel that there was a significant change in the number or severity of mental health patients post earthquake. This seems to be contrary to what one might expect. It is a very interestingcommentaryon the Chilean Health care system. Overall I am impressed with what I have seen for mental health services in the public health system. We have not seen any private health care but it makes us feel good that the most vulnerable in the system seem to be getting good care. The students will have more to BLOG about tomorrow so I am going to let them tell you some more….